Tech at Night: Bradley Manning confesses. Kim Dotcom whines like a stuck pig. Don’t let Pandora be a regulatory Solyndra. 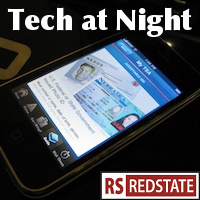 Tech at Night: Light regulation brings fierce telecom innovation. Make Pandora pay their own way. Reform all IP. Tech at Night: Cybersecurity Executive Order needs buy in? Is it still a likely coincidence when all these stories at once come out pushing this topic of spending money to give schoolkids access to the dangerous, adult Internet? Or is somebody funding this drive? Manning confessies to being a spy and a traitor. I wish we could just force choke him. Bad news: New Zealand is arming manatees. Seriously though, if Kim Dotcom wants to fight his prosecution, he should turn himself in, instead of continuing his crimes in New Zealand. So let’s get this straight, even as Obama continues his go-it-alone approach to cybersecurity with an executive order even the Senate is balking at, Obama’s own FBI chief says we need.. you know, CISPA, the bill Obama keeps promising to veto. I’m gratified to hear that we’re at least fighting back now, though. Our systems, on the open Internet, are probably more secure on average than Chinese services, on their filtered Internet. The case for Pandora’s IRFA proposal is falling apart. We’re now at the point where the statist and corporatist plan can only be defended by saying that hey, the other guy gets regulatory subsidy, too. It’s not our problem if your business model doesn’t work because you have to pay people to use their music. Tough. Too bad. Running to government for your own subsidy is shameful and I wish you to fail if that’s the only way you’ll succeed. No more regulatory Solyndras. Speaking of Regulation, Ron Johnson, Darrell Issa, and Bob Goodlatte are really keeping a fire lit under the Obama administration’s runaway regulators. How about some Google? Even as reports come out about Google buddying up with the FTC Chairman, RedState’s own Ben Howe continues to look at the close ties between Google and the Obama campaign and administration. Also at RedState, Fred Campbell takes Susan Crawford and her socialist delusions in book form.